The simplest and quickest way to arrive in Puerto Vallarta is flying. The city's principal airport, the Gustavo Diaz Ordaz International Airport, is located about seven miles north of the city center and most major Mexican airlines as well as plenty American and other international airlines offer flights directly into the airport. Another popular, and much less expensive, way of reaching Puerto Vallarta is on a bus. 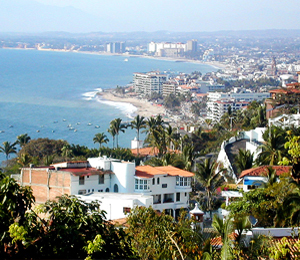 Taking a bus to Puerto Vallarta is a good option if you are coming from another Mexican city. Cruise ships are an easy way of getting to Vallarta and an excellent way of sampling the city for a day or two. Driving to Puerto Vallarta from the United States is possible but not all that simple. Internet cafes and internet hot spots are extremely easy to find all over Puerto Vallarta. They are especially prominent in the Old Town/Zona Romantica area. Several restaurants, bookstores, etc. offer free wi-fi, but your best bet for high speed internet is one of the many internet cafes. Check out Aquarius for 24-hour wi-fi and long-distance phone service. the PVC@fe.com has great coffee available to you while you surf the net and Cyber Milenium offers the best rates. Since Vallarta relies so heavily on its tourism industry, US dollars are widely accepted in most establishments. So are major credit cards. Some people will tell you that you save more money if you exchange your US dollars for Mexican pesos, but most establishments these days adjust their prices to reflect current exchange rates, so you end up spending just about the same. The Puerto Vallarta city buses offer three convenient bus routes that run between the airport and the city center or other areas of Puerto Vallarta. This is an extremely budget-friendly way of getting from the airport to your destination. Keep an eye out for the bus routes titled "Aeropuerto," "Juntas," and "Olas Altas." A taxi ride will save you some time but will also be significantly more expensive. Taxis offer a variety of fixed rates depending on where you want to go. Getting around in Puerto Vallarta depends on where you need to go. If you are staying in the center of town or in the "Zona Romantica" (Romantic Zone, also known as Old Town), your best bet is to stay on foot and bike and use taxis whenever necessary, since getting from destination to destination in these areas is usually inexpensive and quick. If you are going to be staying in other areas outside of the main centers in Vallarta, you might want to consider renting a car to get around. If you are looking to check out some of the quieter and more secluded beaches that line the Banderas Bay, the best mode of transportation is one of the water taxis that make several trips a day. Some of these beaches have resorts and hotels and you can spend several nights out there as well.